Let’s face it, some herbs are hard to swallow – not because they are chewy or toxic but because they just taste sooooo strong that they make your toes curl and your hair stand on end! One solution to the issue of strong but necessary herbal taste, is to create an Oxymel. These are delicious concoctions which take just moments to prepare and have a good storage life. They are made from herbs, honey and vinegar, having a sweet and sour taste which detracts from strong flavours. Oxy- means acid, containing oxygen or contradictory. -mel means honey. I like to think of them as sweet contradictions. Oxymels combine the properties of the herbs, vinegar and honey from which they are made. This morning I made some Oxymels with my Rowan apprenticeship group and the apprentices have plans to use them in salad dressings and food dips as well as for the traditional medicinal purposes. You may also like to devise pairs of herbs which work together, either culinary or medicinally. Ginger and garlic is such a combination. The following is taken from my book which is still not finished!! Preparations of vinegar and honey, where at least one has been infused with herb. The ratio is traditionally 5 parts honey to 1 part vinegar. A traditional method is to combine the honey and vinegar and simmer gently, along with the herb, until the mixture becomes very viscous, like treacle. However I don’t like to heat honey, I follow Ayurvedic advice never to heat it above body temperature. I prefer to infuse the vinegar and honey separately, for 6 weeks, then to combine them and leave them runny, no need to reduce to a thick consistency. 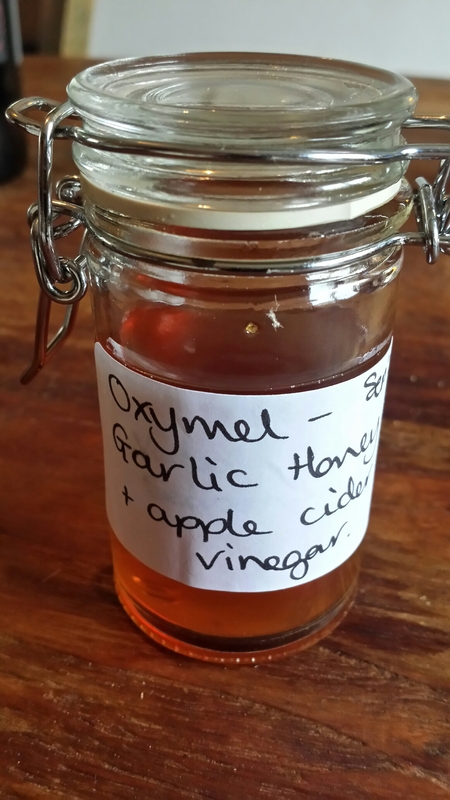 If you have only one constituent infused, the vinegar or the honey, you will also be able to make a useful oxymel. If you have neither honey or vinegar infused, you can simply set up a vinegar and honey herbal infusion and wait up to 6 weeks before straining and storing. 1. Simply combine 5 parts runny honey (which may be previously infused with herb and strained) and 1 part apple cider vinegar (which may be previously infused with herb and strained). 2. Store in a sterile glass jar with non-metallic lid. 1. Fill a small glass jar with chopped fresh herb. 2. Make a non-herbal oxymel using the 5:1 guidelines above (e.g. 100ml honey and 20ml apple cider vinegar). Make enough to fill the jar to the brim as your fresh herb will infuse into this liquid. 3. Pour the delicious liquid over the chopped herbs. 4. Seal jar with a non metalic lid (to prevent the vinegar oxidising the metal). 5. Store for 6 weeks and then strain through muslin into another sterile glass jar. 6. Preserve the oxymel in this glass jar with a well fitting non metallic lid. Long term but keep an eye on it. 1 year plus. 1 teaspoonful a few times a day, of course depending upon the herb used. Oxymels are a very useful way to disguise herbs which have tastes which many find hard to swallow. But they have also been used for millennia to create delicious drinks and deserts. A pleasant way to take them is a tablespoon mixed with a glass of soda water or plain water. Garlic-ginger oxymel is a tasty combination or sweet, sour and spicy. I find it handy to keep in stock for colds, flu or as a sore throat gargle. Peppermint, Sage, Thyme, Mugwort, Hyssop, Garlic (whole cloves), Onion, Ginger, White Horehound, Rosemary – each makes a good oxymel. As ever, note which oxymels you have made, tried and what you think of them. Also record which proportions of vinegar to honey you have tried and found best. Only use herbs which you are certain are completely safe for you to use. If you are really sick, consult a doctor! I use my oxymels for simple ailments such as tickly throats. No matter how much I know that a strong bitter taste is just what I need at a cetain time, it’s often very hard to swallow unless I can soften the blow to my tastebuds. Oxymels are one way to do this. I hope you enjoy them too. 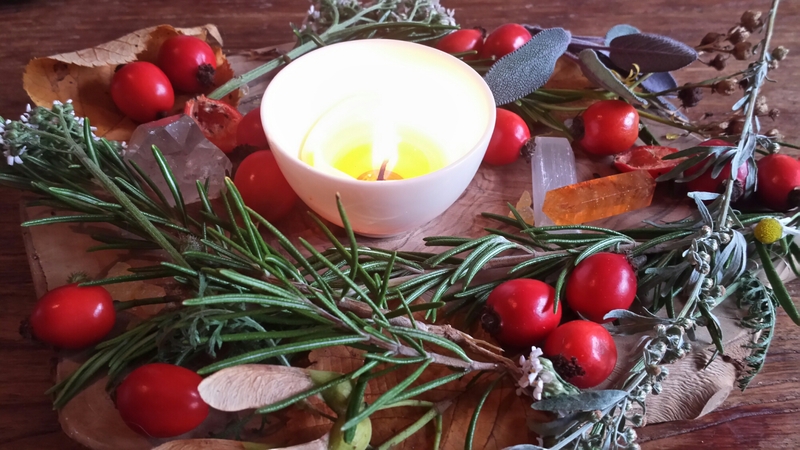 If you would like to learn more about oxymels, perhaps you would like to sign up for my Kitchen Witchery workshop on 12th October 2015.